Dog potty training has changed over the years. Today paper training puppies is obsolete! This is because indoor dog toilet training systems are a new solution to an age-old problem since they allow dogs to take bathroom breaks when a walk is delayed or impossible due to bad weather or unsafe surroundings. When maintained correctly, they can be healthier (no exposure to disease or parasites), and odorless. Apartment dwellers and senior citizens will find this type of dog and puppy potty training aid of great value–and if you are into recreational vehicles or boating they can be a great addition to your pet travel kit. When I first took a close look at the systems I thought of my clients who dig pathways in the snow in order to get their small dogs to toilet outside. It just might make their lives easier. Many of you probably heard about the recent mountain lion attacks on pet dogs and may be worried about predators. 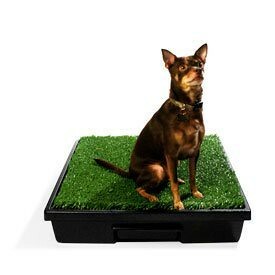 These indoor pet toileting systems offer a safe solution to outdoor potty trips. Since these systems can be used both inside and outside, they are perfect for homes, condos, patios, recreational vehicles, apartments, and commercial facilities. For some, the only challenge will be the initial investment. Indoor dog house training systems can vary but most usually start at about $150 and go up to nearly $800. The exception to this is the WizDog which sells for about $40, the UGODOG Indoor Dog Potty, and the ClearQuest Puppy Wee Wee Training Pad Holder. The PupHead The PupHead is currently #1 in #2. I met Theresa (the woman who came up with the product) recently and her goals are to make products that work for the dogs–and their people. The special antimicrobial blend in the grass helps fight odors, which in turn creates a safer, cleaner environment for the pets. The weaved style back also provides for instant drainage. This helps fight odors and so provides a safer, cleaner environment for the pets who use it. A new addition to the line is the Pup-Pad.™ Made with Microfine fibers and antimicrobial technology, these are absorbent, odor-controlling pads (18” x 28”) quickly absorbs and holds liquid. There is an antimicrobial agent in the fabric to eliminates odors and it is reusable and guaranteed for 300 washes. Pup-Head is very low and almost level with the ground. It also comes with an attractant scent to make it irresistible to dogs. Pup-Head is easy to clean and weighs less than 5 lbs. Replacement pads or grass will last the lifetime of the product during normal use and it is a perfect solution for boating enthusiasts with dogs. I recommend the Pup-Head and you can Order the Pup Head Portable Dog Potty Now. The Throne The Throne by Royal Hound is made of industrial-strength fiberglass and comes with a grate and easily removable polyurethane catch tray within its sturdy UV-stabilized ABS frame that is resistant to fluids, chemicals, fading, cracking and yellowing. 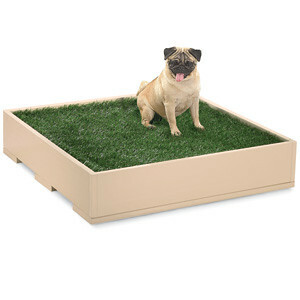 This product comes with a thick, lush, easy-to-clean synthetic grass designed so that waist immediately runs through to the tray below (the tray pulls out for easy cleaning). Replacement grass is sold separately. The Throne is almond color and comes in multiple sizes (Joker 22”x27”x7”, Queen 34”x34”x7”, and King 40”x50”x7”) to accommodate up to 200 lbs. The Pet Loo The Pet Loo was launched in Australia in 2006. Under the grass is a slanted ramp with grooves to direct drainage of the urine into the removable tray in the bottom of the unit. The grass lifts off for easy cleaning. One complaint was that the “grass” was very poor quality and the synthetic grass was tied with pieces of plastic that shredded easily. Another tester said that they still use it after potty training their pet since they live in a high crime area where it isn’t safe to go out at night. Order the Pet Loo. The Pet-A-Potty One of the earliest systems on the market this product is made of virgin polyvinyl material and is easy to clean. The material is guaranteed not to rot, rust, warp, or discolor and is designed for dogs up to 100 pounds. The purchase includes a drainage system and concealed trap pan for easy, safe and sanitary clean up but one buyer said it did not come with the grass and felt he was deceived by the cheap construction. The Pet Potty Another system on the market is a dog toilet box that hooks into your sewage system. You can placed it inside the home and then things just go down the drain. It is easy to flush because the water and the flush button are on the wall at hand level. Learn more about The Pet Potty. WizDog The Wiz Dog System is simple–a durable plastic pan and fitted grate. The liquid waste dispenses through the grate onto newspaper or pee pad, separated from your dog’s paws but the solid waste stays on top of the grate so you never have to touch it. Just flip the grate and be done with it. 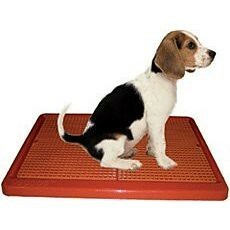 WizDog consists of an industrial grade polyethylene plastic tray and a fitted honeycomb grate (3/8″ deep) and measures 21″ X 28″ (elimination space of 15.5″ X 23.5″). 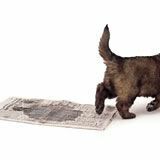 The WizDog was specifically designed to fit most daily newspapers but you can use WizPads or Wee Wee pads. 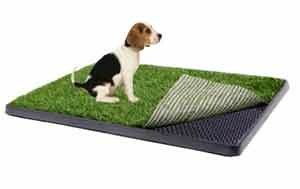 A nice feature is that the pad/paper remains under the grate which prevents your dog or puppy from shredding it. The grate is easy to clean and unlike many dog litter box systems, WizDog does not require the purchase of litter refill or pads. Order WizDog Dog Litter Training System now. 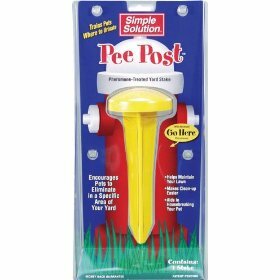 Male Dog Pheromone Training Aids If you are attempting to train a dog to toilet and he still lifts his leg, you can try using a pheromone pee stake or dog hydrant as an attractant. Most dogs lift their legs to mark territory so you shouldn’t have a problem with this inside the home UNLESS you have a territorial marking problem (in which case you need some professional help). 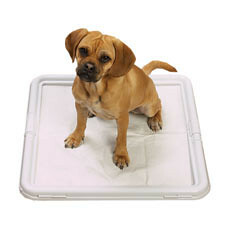 Just place the product onto your dog potty of choice and you are set. 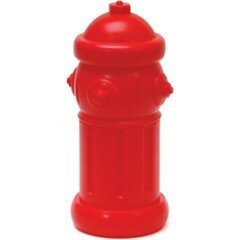 Order Simple Solutions Pee Post Pheromone Stake or Order Pheromone Dog Fire Hydrant. This product is restrains the wee wee Pads without a grate. You simply put the pads in the device and the sides clamp it down securely. I really would like to see people go green and move away from using puppy urine pads. Order the ClearQuest puppy wee wee pad holder now. grass. I would say the real grass is less maintance, but cost more money so for me it is worth the maintance to have the synthetic grass. My Petapotty has given me peace of mind. I don’t have to feel guilty that I am running late from work or going out with friends for the evening knowing that my dog is at home depending on me. I love this product and highly recomend it. It has saved me so much money from having to invest in wee pads. Thanks for taking the time to comment. Many urban dwellers are looking for an option and these type of products help. A nice feature is that the pad/paper remains under the grate which prevents your dog or puppy from shredding it. The grate is easy to clean and unlike many dog litter box systems, WizDog does not require the purchase of litter refill or pads. Thanks for dropping by and letting me know why you like Wizdog. Can anybody tell me how these products accomodate a male dog who lifts his leg. I have a 13 year old dog and we live on the third floor. I think he would appreciate not having to walk up and down the stairs for the last walk of day. Does he always lift his leg? You can teach him to urinate onto the pet toilet inside the house. If you are not going to do this you have two options: Place an object (such as the Pee Post) onto the middle of the product or use two toileting devices–and place one against the location of where you want him to lift his leg with the other below that area. I’ve added these products to the list! I am starting a dog daycare in Indiana within the next month or so. There will be no outside access for a few years. I’m in desperate need of some sort of draining potty box that is not only easy to clean, but strong enough to support the large dogs that will be attending daycare (great danes, mastiffs, st. bernards). I’m also worried that most boxes on the market now are too small for a room with 12-14 large dogs in it. 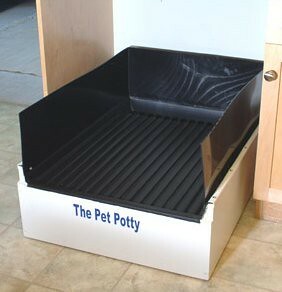 I’ve noticed that pet-a-potty offers really large boxes now but they are insanely expensive in comparison to the smaller versions (almost $2,000!!). I’ve heard some bad things about the Pet Loo not draining properly and the shabby synthetic grass and the thought of pushing 2 or more med. sized boxes together puts visions of broken puppy feet in my head. The Pet Potty attaches to your drainage system and sewer and that might be your best option. I’d think that if you are walking dogs that you would have an outdoor toileting area available. I’m looking to buy a indoor dog potty. 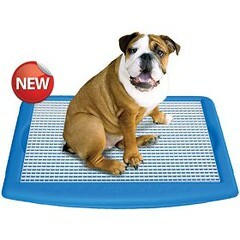 I like the clean and cheap aspects of the grate system but wonder if it is comfortable to a dogs paws or if I should get grass. I’ve heard comments both ways and believe it comes down to preference. 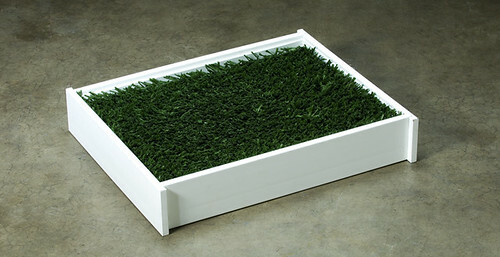 If you are looking for something more appeasing to the eye I’d suggest the faux grass version but if you want something that takes up less space you would benefit from the grate systems. No need to re-invent the wheel since some of the grass systems sit on grates that drain over pet potty pads or another substrate. Thanks for commenting–I took a look at your site and hope your book does well!